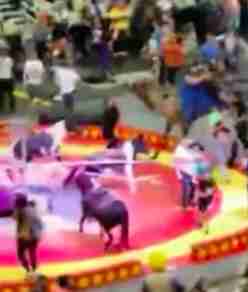 On Sunday, the last day of Shrine Circus' three-day run at an arena in Pittsburgh, Pennsylvania, several kinds of animals were tethered in the middle of the arena, giving rides to children, when chaos suddenly broke out. A camel wearing a blue vest who was in one ring with another camel suddenly started bucking wildly, as if overcome with panic. 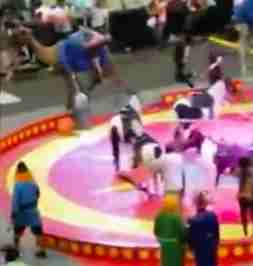 The person astride the camel struggled to hold on as the animal leapt out of the ring and stormed across the arena as onlookers screamed. According to reports from witnesses, a child had thrown a shovel at the camel's feet, which probably terrified him and sent him running. 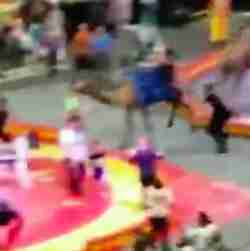 The camel was subdued by staff members when he reached the periphery of the arena. While the incident only lasted a few seconds, fear had already spread throughout the arena, and the incident revealed what can happen when circus animals — often weary from long performances — get scared. Six children and one adult were taken to a local hospital and treated for injuries, the most serious of which was a fractured arm. And, thankfully, no animals were hurt in the incident. But many find the moment, caught on camera by an onlooker in the stands, quite disturbing. "This troubling video shows a frightened camel panicking and running amok with a terrified rider falling from the camel's back," Debbie Leahy, captive wildlife protection manager at the Humane Society of the United States (HSUS), told The Dodo. "Other animals are visibly startled by the camel's behavior, including the ponies." In the last four years, over 50 laws at the state and local levels have been passed to try to regulate and improve conditions for animals in circuses across the country, Leahy said. While this signals a shift in how people are thinking of animals subjected to performing in circuses, for this camel and other animals still forced to perform, change can't come fast enough. 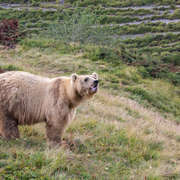 "Dozens of dangerous incidents all over the country are evidence that performing wild animals present a public safety risk," Leahy said, adding that change often starts with letting city council members, county commissioners and other local government officials know that people want bans on using animals in these traveling shows. "This is not the first dangerous incident at a Shrine Circus, and it won’t be the last," Leahy said, "as long as the organization continues to use wild, unpredictable animals in its shows." To help animals in circuses, you can find out the laws in your state and then contact your representative.